Blog - Rarity, Beauty & Low Price All In One! The British Sovereign has been one of the world’s most prominent and trusted gold coins for over half a millennium. The very first English gold Sovereign coin was struck in 1489 – and the coin continues to be made to this day! In the late 18th and early 20th centuries, it was one of the most commonly used forms of gold throughout the world. Over a billion pieces were struck, as the coin served as the world’s gold standard. 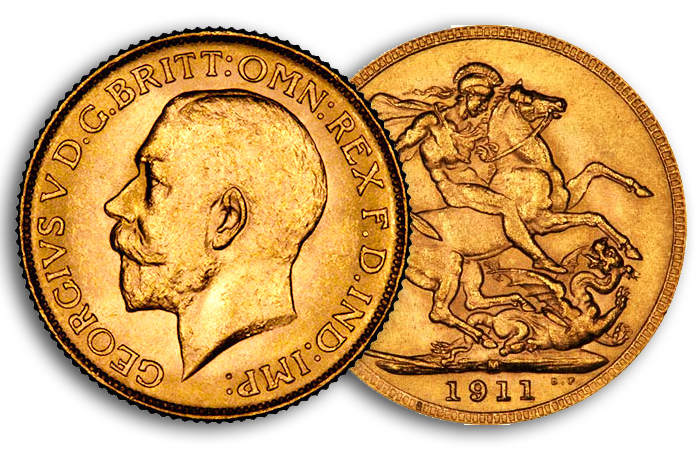 As the British Empire grew, demand for gold Sovereign coins increased across the planet. At its peak, the sun never set on the British Empire; its possessions and territories spanned the globe. Just as the United States established branch mints near mining and population centers, the British government did the same. Branch mints were opened in Canada, India, South Africa and evenAustralia! 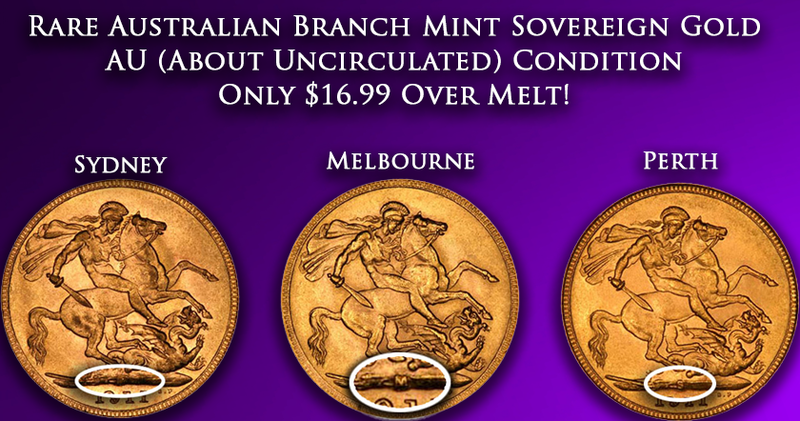 These branch mint Sovereigns are scarcer than their London counterparts – and even more desirable. Most dealers charge a significant premium for the hard-to-find Australia issues. However, we were fortunate to buy a batch at a great price. We thought we were buying common London Sovereigns; we were surprised when we saw the Melbourne, Perth and Sydney mintmarks! 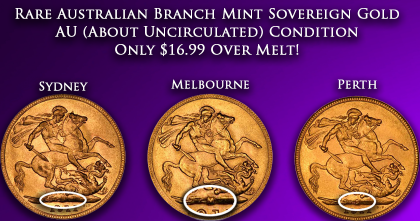 While supplies remain, we can offer you these King George V “Down Under” gold Sovereigns at just $16.99 per coin over melt. That’s less than 5% over melt! Most dealers rarely get these, but when they do, they typically sell for a substantially higher premium. Furthermore, our coins are nice pieces in About Uncirculated or better. You’ll be extremely pleased with the quality! These coins contain 0.2354 oz of fine gold, making them comparable in size and weight to a United States Quarter Ounce gold Eagle. However, they’re priced at a much lower premium – and tremendously scarcer. You’re getting a scarce vintage gold coin with a great story for just a tiny premium over melt. Quantities are limited; we encourage you to act quickly!